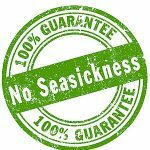 Geographical variation: The three gannet species are closely related and are sometimes treated as one species Morus bassanus, with subspecies M. b. serrator for the Australasian gannet, M. b. bassanus for the northern gannet, and M. b. capensis for the Cape gannet. The Australasian gannet is a large, mostly coastal seabird with predominantly white plumage, long, pointed wings, a long neck and slender body shape. The trailing edges of its wings and a varying proportion of its central tail feathers are black. The wedge-shaped bill is bluish-grey, with a lining of black; the skin surrounding the eye is intensely blue. The head plumage is buff-yellow, which extends down the neck. The sexes cannot be reliably distinguished in the field. Juveniles have mottled dark brown and white plumage, and are separable from immatures, which gradually acquire more white over several moults, before acquiring full adult plumage when about 3 years old. Voice: a distinctive ‘urrah urrah’ to announce landing, during territorial indication at the nest site, and during mutual bill fencing and bowing with the mate. Also an attenuated ‘oo-ah’ to indicate take-off. Both sexes’ calls are identical, with some locational and marked individual variation. Similar species: the closely related Cape gannet is similar in size and appearance, and has occurred in New Zealand as a vagrant. It differs in having a longer black gular stripe extending from the chin down the throat, all its tail feathers are dark, and it has a slower, lower frequency landing call. The masked booby (which breeds on the Kermadec Islands, and occasionally strays to water off the northern North Island) is smaller, and has a yellow bill and white head. 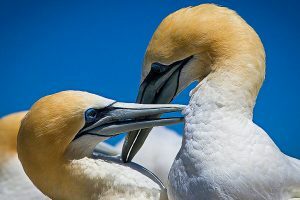 Australasian gannets nest in dense breeding colonies on the New Zealand mainland and coastal rocks and islands, as well as off south-east Australia and Tasmania. Although gannets can be seen occasionally from most places along the coasts of the New Zealand main islands, most gannetries are situated off the North Island. The largest mainland gannetry is at Cape Kidnappers, with around 5,000 breeding pairs. Other mainland breeding sites include Muriwai and Farewell Spit. Australasian gannets mostly feed on waters over the continental shelf. They prefer flat ground for nesting, rather than cliff ledges. Breeding colonies are mostly situated at sites that are completely or largely surrounded by the sea, i.e. on islands or headlands. 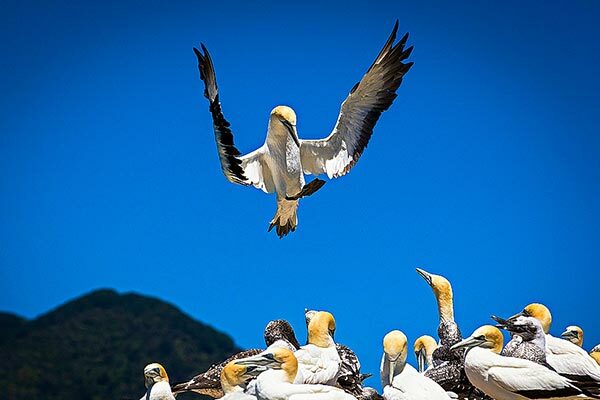 New Zealand holds the bulk of the Australasian gannet breeding population, with about 13% of the population breeding in Australia. The New Zealand population was about 46,000 pairs in 1980-81 and continued to increase at about 2% per annum, although some former breeding sites have been abandoned. Their population is probably regulated by the availability of suitable prey within easy flying distance of breeding colonies. Southern black-backed gulls take some eggs and young nestlings. The breeding season extends from July, when birds first return to the gannetries, to fledging in March-April. Males arrive earlier than females, and re-occupy or establish and defend a nest. From the onset of breeding, the male brings nesting material such as brown algae Carpophyllum, which he retrieves from the shallows. Both members of the pair form and maintain the nest mound, particularly when the surrounding ground is soft from rain. The single egg is produced during an asynchronous laying period that starts in August at Hauraki Gulf gannetries, and September at Cape Kidnappers. A replacement egg can be laid within 4 weeks if the first egg is lost. Laying of replacement eggs can extend into January. Rare two-egg nests may be due to two females laying in the same nest. Eggs are incubated while being held between the webbings of the gannets’ feet. The Australasian gannet can only successfully incubate a single egg. Both sexes share the incubation duty, and later brood the chick on the top of their webbed feet. Feeds are delivered by both parents as incomplete regurgitations, which the chick receives by pushing its bill into the parents’ throats. 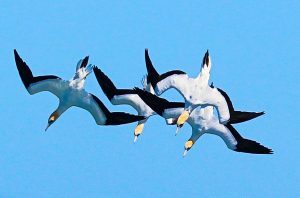 Characteristic behaviours at breeding colonies include mutual bill fencing and bowing of mates at the nest, the territorial headshake and bow at the nesting site, and sky-pointing as an indication of the intention to take flight. The torpedo-like plunge dive of gannets is a spectacular sight, particularly when large foraging flocks form over surface aggregations of fish. Fledglings from New Zealand fly directly to Australia, and typically do not return to their home colonies until their third year. Some New Zealand breeders migrate to Australian and Tasmanian waters to winter between breeding seasons. Australasian gannets often breed with the same partner over consecutive seasons. Some birds retain the same mate for the rest of their lives, but divorces do occur. 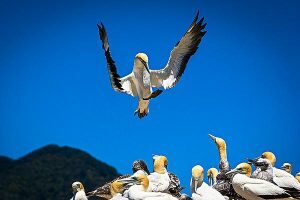 Australasian gannets mainly eat fish, particularly pilchards, Australian anchovies, barracouta, garfish, mackerel and horse mackerel. Other recorded prey includes New Zealand piper, saury, flying fish, yellow-eye mullet, a puffer, and also squid.